With SQL Monitor in place you can spot trends and issues occurring and take action before it becomes a problem for your users. So whether you need to work out how long it's going to be until that disk is full, or be alerted when unusual activity starts to impact database performance, SQL Monitor gives you the information and insight you need, tailored to your SQL Server environment. It comes with preconfigured and customizable alerts to show you priority issues as well as baseline/trend analysis and integrated reporting capabilities. If you’re doing SQL Server monitoring with custom scripts, you know how long it takes. For a growing environment, it can take hours. SQL Monitor cuts your daily check to minutes with a web-based overview of all your SQL Servers that updates every 15 seconds. Overview and Estate show you the status and key metrics for your entire SQL Server estate at a glance. SQL Monitor highlights any issues and sends alerts in case problems escalate without you noticing. You won't miss a thing, no matter how big your environment gets. And you'll never have to fix a broken reporting script again. You know the type of question - “Why was the database so slow half an hour ago?” SQL Monitor gives you the answer and makes it simple to show the problem to other people. Whether you need to talk to your boss about capacity planning, management about slow performance, or developers about troublesome queries, SQL Monitor makes the conversation easy and helps you keep on top of your SQL performance monitoring. Every time you make a deployment, SQL Monitor picks up this information and displays it on the Instance timeline next to key SQL Server metrics. So if you suddenly see unusual behavior after a deployment, you’ll know exactly where to start your investigations. If you’re deploying your database changes using one of Redgate’s deployment tools (SQL Change Automation or SQL Compare) you can see the impact of that deployment directly within SQL Monitor. The Reporting module allows you to create customized reports. SQL Monitor comes preconfigured with over 40 fully-customizable alerts for the most important operational and performance issues. Covering query performance, deadlocks and blocking processes, database and job health, SQL Server issues, database file growth, and machine-level concerns, SQL Monitor helps you find out about problems before your users do. Alerts are displayed in our new Grouped Inbox, arranged by common themes and issues, so they are easier to see, prioritize and act on. At a glance, you can see where the most common problems are, and by opening the group you can see the frequency they are occurring and what, if anything, you need to do about the issue. Monitor your entire estate from one web interface, regardless of location or restrictions, with distributed monitoring. Correlate metrics and compare them to their baseline activity to find the root cause, not just the symptoms, in 5 minutes or less. Which queries have the biggest impact on your system? SQL Monitor gives you the answer. 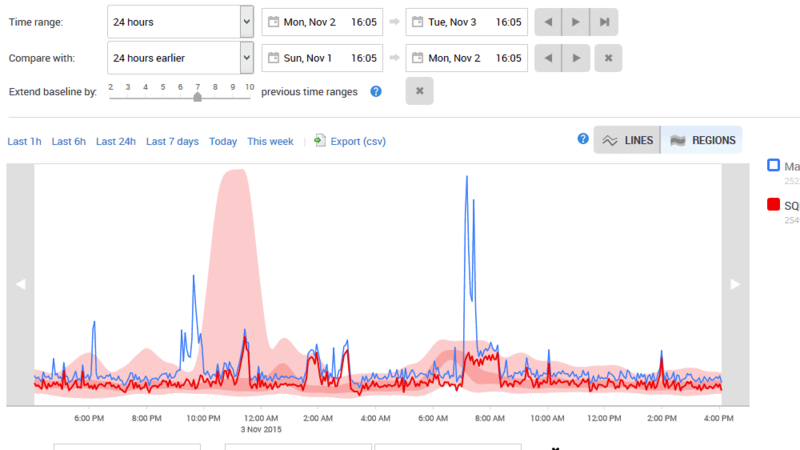 With the query history you can see how queries have performed over time, enabling you to see any patterns and trends that can help you improve performance. Are your servers located locally, in the cloud, or elsewhere? With complete Azure SQL Database support you can monitor on-premise, virtual machines, elastic pools, and Managed Instances all within the same dashboard. You can view all these servers at once for an instant overview, and then drill down for additional metrics tailored to server you're looking at. Dealing with bigger, more diverse SQL Server estates? The Estate tab provides four new views tailored to keep you on top of common issues. Get an instant overview of your installed versions, disk usage, backups, and SQL Agent jobs across your estate. Issues will be flagged for review with additional information to enable you to better investigate and resolve problems. Whether you want more details on our tool, a chat about monitoring best practice, or you’ve hit a snag, we’re here to help. Start SQL Server performance monitoring today – cut your daily check to minutes, with a web-based overview of all your SQL Servers. All prices are per server and include one year’s support and upgrades. For clusters, each node requires a license. Virtual machines also require a license. You don't need to buy extra licenses for multiple SQL Server instances on a server. For Azure SQL Databases, each license can support up to five databases. View full purchasing options or contact our sales team. For customers with more than 10 servers, we offer premium support. See a live version of SQL Monitor showing the real-time performance of the servers that run SQLServerCentral and Simple Talk. Try our simple ROI calculator to see how much you and your company could save by monitoring your servers with SQL Monitor. Discover the four key strategies required for a successful, estate-wide SQL Server monitoring solution, introduced by 5 SQL Server experts. From safely making a change in development through to monitoring its impact in production, Redgate is with you every step of the way. We give you the tools and insight you need to optimize your development processes. Redgate’s Compliant Database DevOps solution lets you extend your DevOps practices to SQL Server databases so that you can optimize productivity, agility and performance across the full database lifecycle and become a truly high performing IT organization.